Male wood duck (Aix sponsa) on the ice of a pond at the Rosamond Gifford Zoo in Syracuse, New York. Uncropped version. The wood duck was telling me to use the Rule of Thirds when I was photographing him at the Rosamond Gifford Zoo last weekend. I did my best but there were other ducks to either side of him. Like in sports photography, photographing animals at zoos or in the wild does not always lend itself to in camera composing of photos. You have little control as to where the animals are or may move to. Thus a lot of my wildlife and zoo photos are cropped for composition. For instance, I was able to crop Mr. Wood Duck’s photo per his suggestion below. 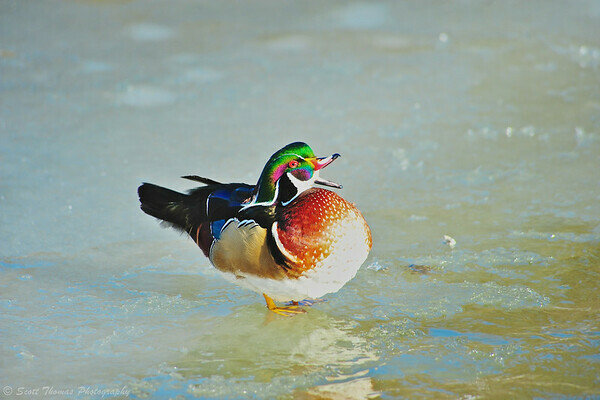 Wood duck (Aix sponsa) standing on ice at the Rosamond Gifford Zoo in Syracuse, New York. Cropped version. His eye is near one of the power points of the frame. Maybe I will add a little bubble with some funny text coming out of his mouth. What would he be saying? Click here to see how other photographers did with the Rule of Thirds assignment. This entry was posted in Assignments and tagged 80-400mm, aix sponsa, bird, ice, new york, nikon D700, rule of thirds, syracuse, waterfowl, winter, wood duck. Bookmark the permalink. LOL I bet they were, too! I remember those commercials. There was another they did for a football field, too. Wood ducks are such beautiful birds. I used to paint their bills in my father’s shop when I was younger. So many different colors. I’d LOVE to photograph one. 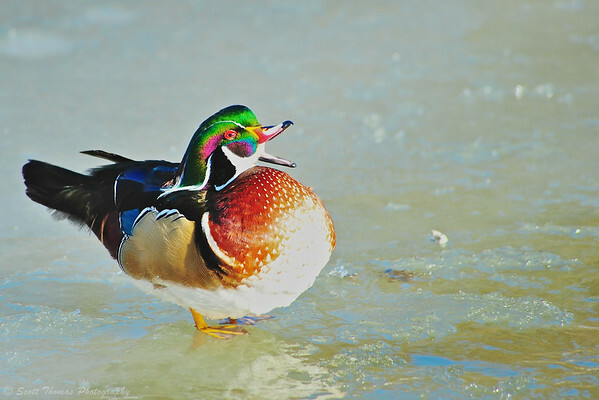 Now THAT is one colorful duck FULL of personality! Did you take any vertical shots of this guy to get his reflection? Yes, I do but the water was not too reflective as they had a couple of water spouts to keep some of the pond free of ice. Really, though Scott – love the duck! So colorful. LOL…works for me and it would not surprise me in the least of that was what he was saying.